One of my mother's favorite expressions is "all ye of little faith" --- it's in reference to me, mostly. Every year, I plant an early bed of peas around Valentine's day. And every year, I give up on the bed less than a month later and replant it. As a result, I'm never quite sure whether the Valentine's peas came up, or whether what I'm seeing is the later peas. This year, I got smart (though no more faithful) and marked my early row of peas, planting the replacement row a couple inches to the side. So I could tell that both rows of peas came up, and that the Valentine's row came up a week earlier than the March row. Now what do I do with two rows of peas where one is supposed to be? 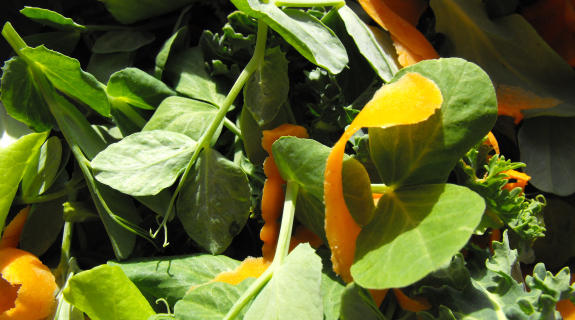 Just as I was pondering this problem, I dropped by Eliza's awesome blog and learned that young pea shoots taste similar to snow peas. Just what I needed to round out the first completely-from-the-farm salad of the year! Lettuce, pea shoots, baby kale (wintered over), and the last of the fall carrots melded into a delectable side dish. Last year we lived on salads for the entire month of March, but I say better late than never! Prepare for summer heat, stock up on automatic chicken waterers. That looks like some fantastic salad mix! I'm glad you found a use for your second row of peas, too. Thanks for suggesting it! We've eaten pea shoots three or four times now, and they keep growing just as fast as the lettuce!